Lift heavy equipment, freight, and other industrial materials with the Manual Pivoting Jib Boom (MJB) from BHS. 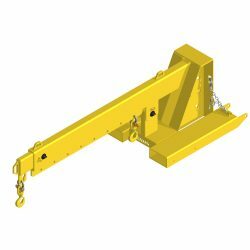 Unlike most other jib cranes, this all-steel unit secures firmly to lift truck forks, creating a versatile, highly flexible solution for heavy-duty lifting. A single unit can be used in multiple locations indoors or out, providing a single-point solution for an entire operation’s lifting needs. A telescoping boom allows users to adapt the MJB for multiple lifting applications, while the pivoting base provides lateral movement along with lift. Steel construction with a durable powder coating makes these units ideal for manufacturing applications and other harsh industrial environments, while models with load capacities of 2,000, 4,000, and 6,000 pounds fit seamlessly into existing operations. Engineers from BHS will also design custom cranes to meet unique specifications, while the manufacturing team builds original equipment at a 138,000 square-foot facility in St. Louis, Missouri. Come to us with your material handling challenges and we will produce the crane that solves the problem permanently. To learn more about custom options for Manual Pivoting Jib Booms, or to locate your nearest BHS dealer, call 1.800.BHS.9500.